NOTE: We always recommend that you should have a survey carried out by a Gas Safe registered gas installer, HETAS installer or qualified NICEIC electrician (whichever is applicable to the goods you intend to purchase) to check and certify the compatibility of your chimney, flue, property and or circumstances prior to purchase to avoid disappointment. 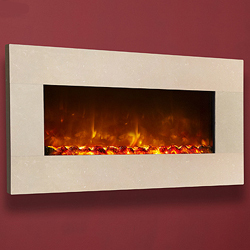 Some of the Celsi Fire fascias are made from real marble or travertine, models such as the Travertine, Prestige Brown & Royal Botticino models which in its natural form will exhibit variation of formation, veining and colour with inherent natural shakes & fissures and or imperfections. It is accepted practice to fill, reinforce in one way or another and in no way is to be regarded as a defect. Conglomerate marble, agglomerate/micro marble, travertine and even natural marble tends to have small air holes within the surface and again is quite normal with this product. Natural marble is subject to change and different veining as no two pieces are exactly the same and therefore cannot be guaranteed as it is a natural product of nature out of the ground, with all associated characteristics/imperfections from its source as it is not a man made product where perfection maybe achievable and as such must be appreciated accordingly. We also recommend that you should wait until you have the goods purchased, onsite, in your possession to take accurate measurements from before proceeding to carry out any building work or create any apertures in the wall to avoid potential costly mistakes being made, as manufacturers reserve the right to alter products or specifications without any prior notice as required.